Sulfate is a primary source of sulfur for most microbes and in some prokaryotes it is used an electron acceptor. The acidophile Ferroplasma acidarmanus (strain fer1) requires a minimum of 150 mM of a sulfate-containing salt for growth. Sulfate is assimilated by F. acidarmanus into proteins and reduced to form the volatile organic sulfur compounds methanethiol and dimethyldisulfide. In the absence of sulfate, cell death occurs by an unknown mechanism. 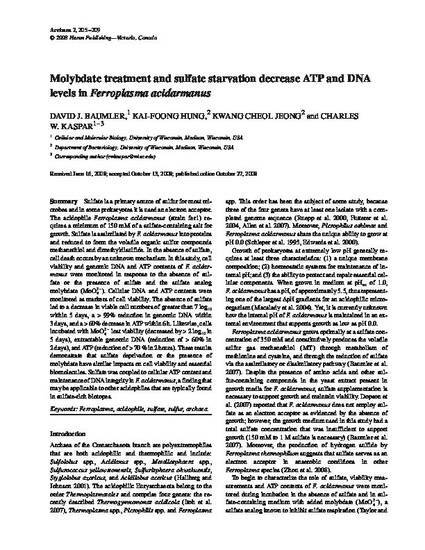 In this study, cell viability and genomic DNA and ATP contents of F. acidarmanus were monitored in response to the absence of sulfate or the presence of sulfate and the sulfate analog molybdate (MoO42 –). Cellular DNA and ATP contents were monitored as markers of cell viability. The absence of sulfate led to a decrease in viable cell numbers of greater than 7 log10 within 5 days, a > 99% reduction in genomic DNA within 3 days, and a > 60% decrease in ATP within 6 h. Likewise, cells incubated with MoO42 – lost viability (decreased by > 2 log10 in 5 days), extractable genomic DNA (reduction of > 60% in 2 days), and ATP (reduction of > 70 % in 2 hours). These results demonstrate that sulfate deprivation or the presence of molybdate have similar impacts on cell viability and essential biomolecules. Sulfate was coupled to cellular ATP content and maintenance of DNA integrity in F.acidarmanus, a finding that may be applicable to other acidophiles that are typically found in sulfate-rich biotopes.